First off, I love these keycaps. I have only ever used ABS caps and figured id give these a shot. Currently running these on my GMMK TKL keyboard with gateron browns. I love the texture of the caps much more than abs. The caps fit nice and snug no problems there. I enjoy the sound the give with the gaterons. Kind of a clicky sound but it isnt over bearing like blue switches. The shine through features work very well. All keys are lit up for me. The font is a little weird with breaks in some of the characters but truly i have already forgotten about that. The set comes with several replacement keys so they should fit most non standard bottom rows and some international layouts. the GMMK has a standard bottom row luckily. I ordered these just before they went out of stock. i would HIGHLY recommend these caps to anyone looking for a clean, black pbt set! You can't get sinlece, lighting circus and old school quality with PBT in same time. Off course PBT are louder than ABS. I have Cherry MX Brown Francium Pro and my friends are amazed with sound, special people who like Cherry MX Blue because Brown with PBT sound almost as Blue but without famous agresive click from Blue. But people even like that more and say that sound even more closer to old keyboards than Cherry MX Blue.Brown Double Shoot PBT are real experience of mechanical keyboard and if you use O-Rings than better buy ABS keycaps and use your light properly. I neve use light on Francium Pro, only mode to shine only taster I press for 2 seconds.Because PBT are not for backlight. PBT is for non backlight keyboard to give you typing and sound impression of real and durable keyboard. My keyboard even if you don't see model when you hear you recognize quality keyboard not usuall mechanical keyboard. You have impression of something special.Becuause Brown keys and bottom out sound mixed with PBT keycaps is wining combination for me real experience of mechanical keyboard and they are not to bad for gaming. It;s not as red or black, but better than other switches, and who want keyboard for both purpose my advice Brown PBT, non backlight or turn off backlight. For nise look and silence, Double shot ABS from Filco in combination with Convertible 2. It's normal that PBT keycaps are louder than ABS keycaps. ABS keycaps sound almost as alloy of rubber and plastic, they sound cheap. PBT sound as real mechanical keyboards as we remember them.I have Francium Pro with Brown and they sound almost as Blue, without click of course, but very similar and they sound GREAT.It's not aggresive click as on Blue but real feel of mechanical keyboard.Why you bought PBT keycaps if you want silence and o-rings, by then ABS.Next keyboard I plan to buy is Filco Convertible 2 same with Brown, I will not separate from Brown until some great model as Deck or Filco show up with Clear, or I will solder Clear to some of these two.I'm always happy because I decide to choose Brown instead of Red. My choice would be Black over Red, Green over Blue and maybe Clear instead Brown, but Browns are great.If you need backlight, RGB, silence etc. you should stick with ABS. PBT keycaps are for non backlight keyboards and real enthusiasts who like classic and old school keyboards and unmatched typing experience. 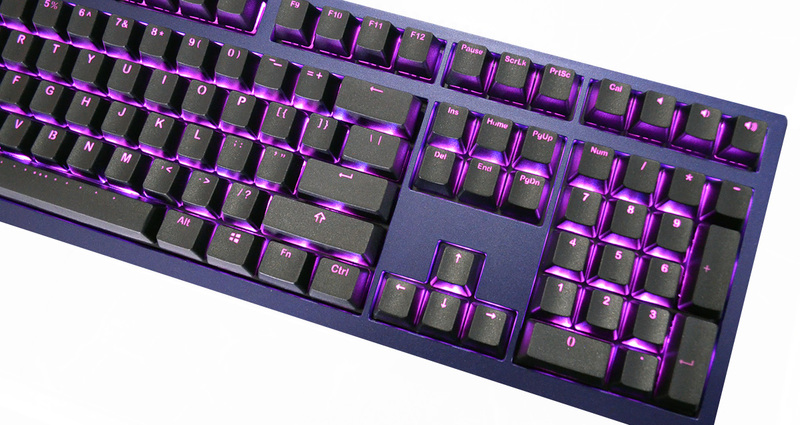 For gaming mechanical keyboard I would advice ABS or Topre switches.For Filco Convertible 2 I will buy set of double shot ABS special for Filco and one set of PBT, side printed, grey or without visble fonts, maybe engraved as Ducky but without color. You will never find silent and clear completely transparent PBT keycaps. They are not for backlight, they could be used but that look far worse than on ABS.I to late figure out that I don't need backlight at all, because of that I used mode only key I press shine 2 seconds. You can't get lighting circus or rave party and old school experience, quality, durability in same time. You need to choose.Deck have backlight keyboards and light is far better visible on Asian models with ABS, but typing and fonts are for my taste better on USA version even if people don't like them I use such fonts and on PC long time. Just rec'd these today and am installing them on an older logitech G710 (cherry brown) that have gotten very smooth/shiny. While I like the feel of the new keys, I don't like how the keys bottom out. I can't effectively install dampeners on these because the stem is so long with no cross stabilizers. So. the end result is that these are much, much louder than the stock logitech abs keys or the stock keys on my das keyboard I use at work. I'll give them a week to see if I can get used to the "clatter". They are very well built thick PBT and the POM inlays let the legend shine through just as well as ABS. The font is large and clear, the revised version with all the symbols top aligned leaves nothing unlit. The font is similar to what is used for curb striping, I like it but the small breaks in loopy letters might bother some. Comes with a ton of alternate keys for non-standard keyboards. Interesting other note about these; if you turn off backlights they look like blank keys. Only thing I find off is the capslock is an arrow pointing down for some reason. Overall these are great keycaps. 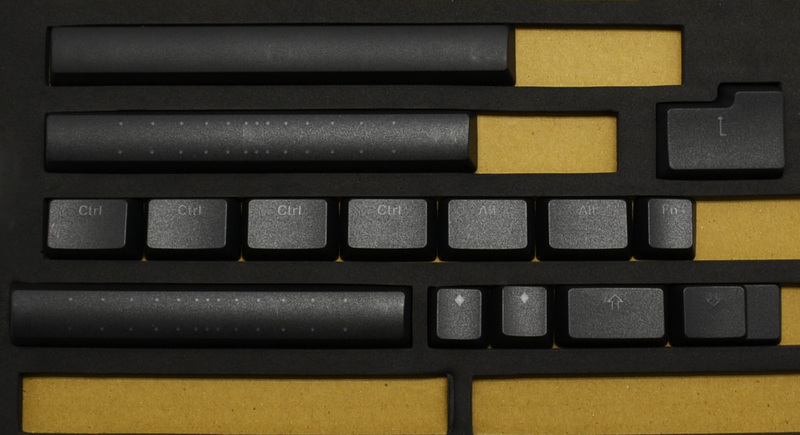 They have a lovely moderate granular texture one expects from PBT keys, and look pretty good, too. My keys arrived with a few manufacturing flaws; some scratches, nicks in the bottom of a few keys, and some black plastic that leaked into the molding of the home key lettering(looks like it says 'hume'), but are only superficial and mostly obscured once placed on the keyboard. None of these defects were enough for me to go through the effort of exchange, and do not affect my typing experience. Perhaps a bit more quality control would be nice, but overall I'm very happy with this product. Really great caps. The only option that I know of for backlit pbt. A couple small issues. Due to the font, buttons such as the home button kinda looks worn because the "O" in home has breaks in it. I think the big HM that ducky has would have looked better. The numpad and enter is slightly dimmer than other keys. Still lit though. The placement isn't aligned with the led. They aren't as thick as normal pbt's. probably because they need to let light through. I still give them 5 stars. I love them and I'm sure they'll hold up very well. I received this keycap set today to use on my new Ducky Shine 6 Special Edition mechanical keyboard. They feel great and have a thickness that makes the keys feel."premium". However, there also seem to be certain issues. It is my understanding that PBT keycaps have a harder time shining LED lights through. On this part, these perform spectacularly. As mentioned by previous posters, the issues with the stacking of numbers and symbols have been adjusted to shine the light equally. The problem, however, is the addition symbol and the enter symbol on the number-pad side. These keycaps tend to be much dimmer: the darker/duller colors are almost unnoticeable while the brighter colors shine through unsatisfactorily. If you're going to install these to this particular keyboard, proceed with caution. If you're using the stock, Ducky keycap pullers, there's a likely chance of hurting the body to remove this keycap set. (I have not hurt my keyboard in any way, but the fit was so tight that the puller had direct, pressured contact with the frame.) This is due to the fact that the room between the keys are inadequate for the thicker, stock puller to enter. I've make-shifted a wired puller which seems to do the trick; therefore, I'd advise the users of Ducky Shine 6 Special Edition to purchase a set of wire pullers when ordering these. In conclusion, the keycaps feel amazing and durable. They are very thick and make a pleasant "thock" sound when used with the Cherry MX Brown switches--on the aforementioned keyboard. These, however, have the aforementioned issues, which may disappoint. For me, their feel is enough to keep them installed, but I am pretty dissatisfied with my dim addition and enter symbol. Finally, don't forget to purchase a set of wire keycap pullers if you're installing them onto the same keyboard as mine or you may risk damaging the keyboard. Despite the 5-star rating in this review, I would give them a 4.8 at best and 4.65 at worst. I installed these keycaps instead of default ABS ones that my Pok3r backlit keyboard came with, and wow I'm impressed! The feeling is great, the typing sound is much improved due to keycap thickness and the backlight comes through very well and evenly. I like the font too. It is a bit larger than on the default keycaps, but it looks good. These keys are nice. They come with 126 keys. Along with the standard keys, you get a few different non-standard spacebars, some extra keys (e.g. volume and calculator keys for ducky style keyboards), and some R1 keys for keyboards with non-standard R1 sizes. The keys are nice and thick and are a nice upgrade to some of the standard ABS keys. I, personally, am currently using this keycap set for a Hyper-X alloy FPS mechanical keyboard. They feel and sound much better on the Cherry MX Blue switches. I bought these to replace the default code keyboard keys. The whole set feels and look amazing. The shine through color is slightly more yellow than the original code keyboard keys but not by much. I can confirm with what Omega said about the number row keys now being corrected. Vortex must have updated these, since the set I got included space bars that had dots to let the LED lighting shine through, and the number keys had the symbols next to the numbers instead of above. They remind me of the keycaps the Ducky Shine 5 comes with, actually. The PBT also feels nice, and I have no complaints about them. It seems like Vortex heard the complaints that people like Ethan made on here and updated these keys. I was pleasantly surprised! So if you're wondering if these are worth buying, let just answer a few questions for you. Yes, these are definetely PBT, and yes, the texture is there and it is wonderful. It feels exactly like you would expect double shot to feel, very distinct texture differences and all. These keycaps are well built and come in both black and white as well, so with all that said, what are the drawbacks if any? Well, there are a few. One, is the number keycaps for the top row, the legends are not aligned horizontally, so you will only see #, @, $, and so on be illuminated, the actual numbers will not. Another downside is the PBT Spacebar has no illumination, and doesn't quite feel as good as the other keys. And if you have a 22 key numpad, there is no small or secondary esc, tab, backspace, fn, 00, single 0, or . keycaps in this set. The only other con is the text used here, which may or may not to be your liking. BUT, all in all, I still say this is a safe buy, all I would say is look at the other options online for translucent pbt keycaps, and be on the lookout for the new ones from Ducky. The Shine 6 should have them, and they should have the alignment issues fixed, and possibly better, more appealing font as well. But, if you need these kind of keycaps now, this is still a safe buy.